For CES 2019, Lenovo has decided to take a different tack with its next Legion laptops. The Lenovo Legion Y740, as it’s now called, brings RTX graphics and a host of premium features that were once optional to both its 15-and- 17-inch models. Of course, this inherently hikes the starting price up to comparatively astronomical levels, but that appears to be the point. Lenovo aims to attract a gamer that’s more flush with cash this time around. Will these changes bring more into Lenovo’s ‘Legion’ of fans – or will they see the Legion lose some numbers? Lenovo is asking for $1,749 (about £1,373, AU$2,454) to pick up a 15-inch Legion Y740, and $1,979 (about £1,554, AU$2,777) for the 17-inch model. Both versions will launch this February in the US, though UK and Australia pricing and availability is currently unknown. This is a huge leap in price compared to last year's Legion Y730, likely on account of several features now coming standard that were once optional upgrades, namely within the display. Both models come with your choice of 8th-generation Intel Core i5 or i7 H-series processors as well as Nvidia RTX 2060 graphics to start, with the 15-inch model maxing out at an RTX 2070 Max-Q and the 17-inch capping off with the RTX 2080 Max-Q. Both laptops feature anywhere from 8GB to 32GB of 2,666Hz DDR4 memory as well as PCIe SSDs up to 512GB alone or paired with a 2TB spinning hard drive. Finally, both models also come rocking a Full HD display with 144Hz refresh rate and Nvidia G-Sync technology to reduce visual stutter and tearing. 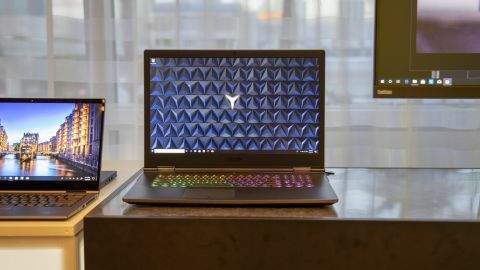 This all puts both versions of the Legion Y740 in a rather competitive place with several high-end gaming laptops, including the Razer Blade and Alienware m15. Lenovo hasn’t changed much about the Legion Y740 design over last year’s Y730, and that’s just fine save for one flaw that’s gone uncorrected: the webcam still sits beneath the display. We love the anodized aluminum shell coupled with the clever barrel hinge that’s moved up toward the keyboard, and just about everything else about the laptop’s design. But, there’s no reason for a 15-or- 17-inch laptop to have what amounts to a ‘nosecam’. Otherwise, the Y740 is still just as attractive and comfortable as before: both the 15-and- 17-inch models are still just 0.78 inches and 0.86 inches thick – and weighing 4.8 pounds (2.2kg) 6.3 pounds (2.9kg) – respectively. The vast majority of Lenovo’s changes are happening inside the laptop. Still, we’d like to note that the lovely per-key RBG-lit AccuType keyboard and silky-smooth touchpad remain, so worry not. However, we found the keyboard to be bit squishier and less forceful than we remember. Also, all of the existing port options remain: one Thunderbolt 3 port with DisplayPort, three USB 3.1 ports, HDMI 2.0 and a mini DisplayPort. As for the display, which remains at Full HD (1,920 x 1,080) resolution and 300 nits brightness, Lenovo took the two biggest optional features for the previous model’s screen and made them come standard. This includes the 144Hz refresh rate as well as Nvidia G-Sync technology built-in. This is a major upgrade for a display that already was plenty vibrant and rich, especially for it to come standard. If you want even more fidelity, the display can be upgraded to 500 nits of brightness and with support for Dolby Vision HDR 400. This should help cover up some of the gaps left by the 72% color gamut, which is getting long in the tooth now. Without making too strong of judgments here, we expect the Legion Y740 to be plenty powerful with the parts inside on offer. Of course, between H-series Intel processors and the latest RTX graphics, Lenovo needed a better cooling solution. Lenovo has updated its Legion Coldfront Cooling System to better support the increased power profile, doubling down on its cyclical dual-fan strategy. With this, we expect a serious showing from Lenovo’s gaming laptop in a full review. Not to mention that Lenovo claims both versions of the laptop will be able to last for up to six hours of mixed use, thanks to a now-denser battery inside. While nowhere near what we’re used to from general laptops, this would certainly help close that gap. It’s crystal clear where Lenovo’s focuses were with its Y740 gaming laptops update: power, power and more power. But, perhaps that was to the detriment of at least one necessary change that didn’t happen: the webcam position. While that won’t make the gaming broadcasters out there very happy, it shouldn’t be a deal breaker for the average gamer. What may be a deal breaker is the vastly inflated price over last year’s models. Of course, Lenovo is simply following the trends, with several features that were once optional now coming standard and still at a competitive price with competing laptops featuring similar niceties. Stay tuned for a full review to see whether the price hike is worth your while.